Limited lifetime warranty. Call 1-800-527-0998 for complete warranty details, parts and installation help. 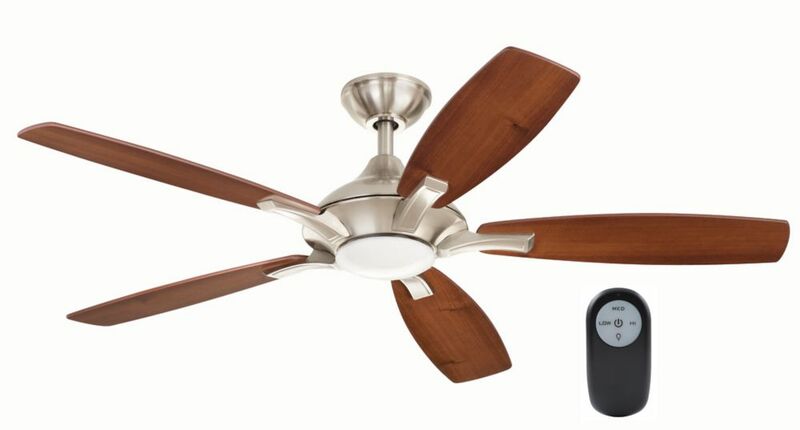 Recapture the beauty of times gone by with the Hampton Bay Carriage House 52-inch indoor ceiling fan in iron finish. The fan features a 4-light kit with antique beige alabaster glass shades and 5-reversible blades in walnut and rosewood finishes for a versatile look that complements a wide variety of room decors. The Carriage House's flush mounting style makes it an excellent choice for rooms with low ceilings. The 54 In. Sidewinder ceiling fan in brushed nickel finish uses an integrated light with white opal glass. Perfect for large rooms with vaulted or sloped ceilings. Includes 5 silver finish blades. Includes 190W limiter for energy savings. Also includes safety cable. Lifetime motor warranty. Petersford 52-inch 5-Blade LED Brushed Nickel Indoor Ceiling Fan with Light Kit and Remote Control Add an updated look to your transitional decor with the Home Decorators Collection Petersford 52 in. Brushed Nickel Ceiling Fan. This 3-speed fan features 5 reversible blades to help move air efficiently, with quiet, wobble-free operation. The light kit offers a white lens and includes an LED to provide brilliant illumination. The handy remote control provides independent light and speed controls. Petersford 52-inch 5-Blade LED Brushed Nickel Indoor Ceiling Fan with Light Kit and Remote Control is rated 3.5 out of 5 by 4. Rated 5 out of 5 by Momofthree from Beautiful, elegant Comes complete. Easy to install and very quiet. The dimmer feature is nice and the remote makes it our favourite. Rated 1 out of 5 by Pamm from Defective motor So pleased with the appearance of this unit. It was rather tricky to install. Turned it on & there was a clicking sound as the blades turned. Info said the sound would likely disappear in 24 hours. Overnight the motor stopped working but remained hot. Have to exchange unit. Rated 5 out of 5 by Alex from Love it.....easy to assemble! I bought this a couple of months ago. Love it great features quiet, modern looking . The light dims with the remote, great feature!! Rated 3 out of 5 by Austenx from Careful with installation to avoid problems The fan is nice if you pay attention and make adjustments. When hanging the fan, make sure the hanger ball rotates and drops into a check groove. This will allow plenty of room for the receiver to fit. Put some vaseline on the hanger ball before hand...and some on the rubber grommet on the canopy. This will eliminate an annoying ticking noise reported with this fan. The fly wheel where the fan blades attach is not fully true...so the blades end up not even. Best bet is to bend and adjust. Place the blade assembly on a hard floor and measure distance each blade is from floor and carefully bend which is tedious and difficult. The LED light is great and puts out a good amount of light at full power. It's a nice design, but is prone to disappointing performance if you don't follow above notes. Can this model be installed as flush mount? The installation instructions do not indicate this but i was wondering if it is just a matter of removing the downrod and ball included? The fan can not be installed as a flush mount. Only with a downrod.